Fiesta Farm generally has school animals available for clients to learn on. They allow riders to test their interest and develop their skills without investing in a horse or pony of their own. User Friendly, aka Montana was a wonderful 20 something horse with a kind and gentle demeanor. 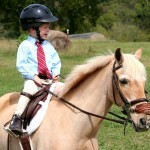 He spent his entire life helping countless riders to learn to walk, trot, post, canter, jump and even horse show. He was big enough for most adults to ride yet kind and safe enough for the very youngest riders too. Montana had to be put down in the spring of 2015. Many thanks to Montana for his kind and loyal service to so many. May he rest in peace. Fiesta Adorado, or Behr, has stepped into the role of assistant instructor with his fun outlook on life. Behr is a home bred large pony by Brennan at Clovermeade Farm in middle Tennessee. He is a half brother to many, many wonderful ponies spread all over the country. He is darling looking and a good mover. Lemon Drop, or Dickens in an invaluable member of the staff, doing lessons for the smaller crowd. He is one of the nicest ponies ever to learn on, if you are little enough for his old bones. He has been a staple at Fiesta Farm for the past 20 plus years, currently teaching three to 10 year olds to be confident, competent beginning riders. Lemon Drop aka “Dickens” with a previous lessee Henry, circa 2014. Here is a snap shot of Montana, our dear departed assistant teacher, as well as the school master small pony Dickens. User Friendly doing double duty as a VAULTING HORSE in 2011.